So we’re still in April and my list of fashionistas keeps on going. So I’ve decided to put Kristina Bazan’s (from Kayture) outfits as inspiration on today’s topic: how to wear white. From Geneva, Switzerland, Kristina is a 19 year old top-fashion blogger behind the renowned blog called Kayture . She started her blog back in 2011 due to her passion for the fashion industry. She decided to name her blog that way because in kindergarten she was called by the first letter of her name, back then when she lived in the USA. So she decided to use “Kay” for Kristina and “ture” which stands for couture and geniusly ended up with Kayture. Her polished and chic style reflects her big admiration for Gabrielle Chanel, Karl Lagerfeld, Louis Vuitton, Miu Miu and Dior. Now you can understand why she dresses so chic! I really admire the work of this blogger, handling school and a blog is not easy. That’s why I totally really agree with her when she wrote: “Destiny is for losers; it is just a stupid excuse to wait for things to happen instead of making them happen.” Being in school, having to do photoshoots every week and travelling around the world looking so chic everyday have made her one of my favorite bloggers. Watch and learn how she wears this season’s trend: WHITE. Hope you enjoy it and don’t forget to check out her blog for more fashion tips and trends. How are you wearing white this season? Let me know via Instagram using #wearwhite hashtag and I’ll post your pictures by the end of this week on my blog. Seguimos en Abril y mi lista de fashionistas sigue creciendo. Así que hoy decidí poner a Kristina Bazan como ejemplo e inspiración del tema de hoy: cómo usar el Blanco. De Ginebra, Suiza y con tan sólo 19 años, Kristina es la top bloggera de moda detrás del famosísimo blog llamado Kayture. Kristina empezó su blog en el 2011 debido a su gran pasión por la moda. Decidió ponerle ese nombre a blog debido a que cuando era pequeña y vivía en Estados Unidos, la llamaban por la primer letra de su nombre. Así que decidió juntar “Kay” de Kristina y “ture” de la palabra couture y formó Kayture. Su estilo elegante y de alguna manera ‘limpio’ refleja su gran admiración por personas como Gabrielle Chanel, Karl Lagerfeld, Louis Vuitton, Miu Miu y Dior. Ahora podemos entender porqué se viste tan padre siempre. En realidad admire mucho el trabajo de Kristina, el tener clases y además llevar un blog no es nada fácil. Por esto mismo me identifiqué mucho con ella cuando escribió “El destino es para perdedores, es una escusa tonta el esperar a que las cosas sucedan en vez de hacer algo para que éstas sucedan.” Llevar una vida de estudiante, tener que hacer photoshoots cada semana y además viajar por todo el mundo viéndote siempre así de chic son las razones que hacen que Kristina sea una de mis bloggeras favoritas. Ahora solo queda ver y aprender de cómo ella usa una de las tendencias de esta temporada: el BLANCO. Espero que les guste y no olviden visitar su blog para encontrar más tips y tendencias de moda. ¿Cómo estás usando el blanco esta temporada? Házmelo saber por medio de Instagram usando el hashtag #wearwhite . Al finalizar la semana estaré publicando tu foto en mi blog. I guess you’ve been in the same situation as me… Trying to wear a fashion trend but don’t know how. Sometimes the trending clothing piece, color or accessory is something you will normally don’t wear or probably don’t feel comfortable in, since it’ll be the first time you wear it. In this case what I do is to wear other items that happens to have the trend but in a small/indirect way. With time I’ll start wearing it in its original way. For example, checkers. 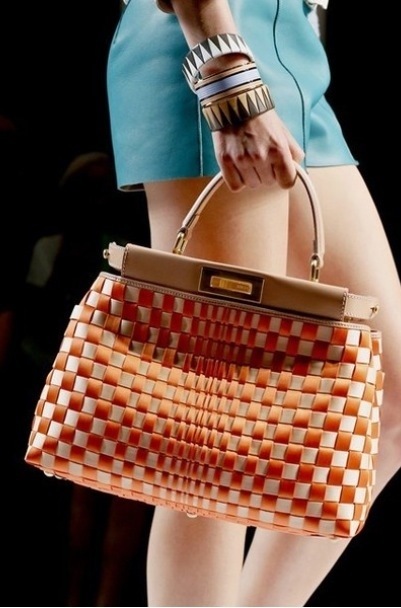 I love the way this pattern looks in dresses, pants and shoes but the first time I wore this trend was on bags. Here’s an example of how you can wear the trend in a safe but still in a fashion way. These are two Fendi bags, they’re adorable and a great way to start applying the checkers trend. Later try wearing the trend on shoes even on dresses and pants, they look amazing! Just remember to play safe accessories when wearing the whole look. How will you wear this trend? Me imagino que alguna vez has estado en la misma situación que yo, quieres usar una nueva tendencia de moda pero no sabes cómo. De alguna manera el color, accesorio o prenda que esta de tendencia no es algo que usarías normalmente o bien es algo que no te sientes agusto ya que sería la primera vez que lo usas. Lo que yo hago en estas ocasiones es usar piezas que de alguna manera incluyen la tendencia pero ‘indirectamente’ o en una versión pequeña. Con el tiempo empiezo a usar las prendas o colores o lo que este de moda de la manera en que debería de ser. Por ejemplo, los checkers. Me encanta como se ve esta tendencia en los vestidos, zapatos y bolsas de hecho la primera vez que empece a usar esta tendencia fue con una bolsa. Aquí te presento una manera de usar esta tendencia de forma segura pero al mismo tiempo te verás muy a la moda. Estas dos bolsas Fendi las cuales me encantan y estan increibles aplican la tendencia de los checkers. Con el tiempo atrévete a usar esta tendencia en zapatos, vestidos e incluso pantalones, se ven padrísimos. Sólo recuerda llevar accesorios simples ya que los checkers por sí mismos llaman mucho la atención. ¿Cómo usarías tu esta tendencia? As I said to you earlier this month, April’s posts are going to be dedicated to all of my favorite fashionistas. So this week I’ve decided to dedicate each post to the international bloggers. They are ordinary girls from around the world that influence hundreds and thousands of people through their blog. They are known for wearing all kind of brands that go from Zara and H&M to Prada and Louis Vuitton. They’re invited to the finest and exclusive designer parties. And best of all, they’re paid for wearing designer clothes and accessories on their photoshoots. Today I bring to you a Los Angeles’ blogger. Her name is Aimee Song and she is the creator of SongOfStyle.com. She is an interior designer and she started with a blog that talked about this topic. But one day she posted one of her outfits and since then her blog became a personal style blog. Today her blog is one of the most read blogs in the world. In her blog you’ll find lots of pictures of her amazing outfits and the cool thing is that you can also find DIY videos that will teach you how to create framed chalkboards as well as how to organize your closet. The next video is one of my favorite ones. Here Aimee let us inside her closet and give us some tips on how to organize it. Hope you like it as much I do. And don’t forget to visit her blog and follower her on Instagram @songofstyle. If you think there’s a fashionista I haven’t included to the list, feel free to let me know. I’ll be so happy to include her on my next posts. So you were not able to go to Coachella’s music festival this past weekend? Don’t worry here you’ll find Coachella’s fashionistas in just one place. I guess this next fashion icon doesn’t need to be presented. All I need to say is that her last name is Delevingne and that she is the new IT GIRL in the fashion world. Every designer, every magazine and every photographer wants to work with her. Her model-off-duty style inspires the look of today’s post. So Coachella‘s annual music festival is taking place this weekend. Celebrities, music artists and fashion icons from all around the world are meeting this weekend in California for the event. And to inspire the Coachella’s look I decided to let Cara Delavingne be the one who teach us how to pull it off. Here’s what you’ll need basically: a white t-shirt, denim short-shorts, mirrored sunglasses, indie/boho accessories and lots of sunscreen. How will you dress for this occasion? Send me a picture of your outfit via e-mail or tag it via Instagram using #coachellaWG and I’ll include your outfit and blog’s web site on monday’s post.